In love. 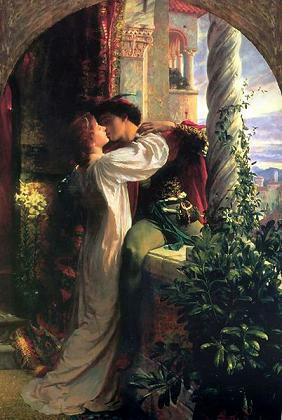 Romeo and Juliet portrayed by Frank Dicksee. Любо́вь -- э́то смысл жи́зни. Love is the meaning of life. Он призна́лся в любви́ свое́й де́вушке. He made a declaration of love to his girlfriend. Алекса́ндр Пу́шкин изве́стен свои́ми стиха́ми о любви́. Alexander Pushkin is known for his poems about love. Вы по́мните свою́ пе́рвую любо́вь? Я люблю и ненавижу тебя. I love and hate you. У них любо́вь с пе́рвого взгля́да. Солдат воевал из любви к родине. The soldier was fighting for the love of his motherland. Maternal love has no limits. literal The love is vicious, you can fall in love even with the billy-goat. literal Where is the love and advice, there is no sorrow. literal When love whispers, the mind falls silent.